Arrive in Entebbe International Airport where you will met and assited bya Trails of Africa Safaris airport representative and later transferred to your Entebbe city hotel for the evening.Overnight at Central Inn Hotel in Entebbe (Budget Option) Bed and Breakfast. After breakfast, drive to Kibale National Park and have a lunch en route arriving in the afternoon. Go for a late evening walk a long Bigodi swamp to search for variety of bird species like the White-winged Warbler, primates and many more not forgetting the flora. Overnight Kibale National Park is home to a remarkable 13 primate species, including the very localised red colobus and L’Hoest’s monkey. Kibale’s major attraction, however, is the opportunity to track habituated chimps.Overnight at Chimpanzee Guest House (Camping Ground) booked on Full Board: Lunch/Dinner/Breakfast. After breakfast go for nature walk in Kibale Forest. You will hunt for chimpanzees, watch monkeys swing through the forest while tracking. Return for lunch at the lodge and then drive to Queen Elizabeth National Park. Queen Elizabeth National Park is home to over 95 mammal species (among them elephants, lions, leopards, kobs, buffaloes, jackals, spotted hyenas) and 10 primate species, like chimpanzees, velvet monkeys, blue monkeys, red tailed monkeys, black and white colobus, olive baboons. The parkis also home to 606 birds’ species.Overnight at Simba Safari Camp (Camping Ground) booked on Full Board: Lunch/Dinner/Breakfast. Enjoy early morning game driver searching for Hyenas, Elephants, Hyenas, Hippos, Buffaloes, the Lion and many more. Return from the drive for lunch at Mweya Safari Lodge. In the afternoon go for a launch trip on the Kazinga Channel to Lake Edward to see animals like buffaloes, elephants, hippos and plenty of birds.Overnight at Simba Safari Camp (Camping Ground) booked on Full Board: Lunch/Dinner/Breakfast. Have breakfast and proceed to Maramagambo forest for a walk. Have picnic lunch in the forest before proceeding to the Kyambura gorge. Take a walk in the gorge and along Kyambura River where the game reserve derives its name. This walk rewards you with a view of a great number of primates such as chimpanzees, antelopes, Black and white Colobus monkeys and water birds like the flamingos. Later head out to Bwindi Forest National park arriving in the evening for dinner and overnight.Overnight at Buhoma Community Bandas (Camping Ground) booked on Full Board: Lunch/Dinner/Breakfast. Enjoy breakfast followed by brieing before leaving for gorilla tracking in Bwindi. The trekking of gorillas is unpredictable, and therefore difficult to determine the time it takes however, it ranges between 2-9 hours depending on the movement of the gorillas being tracked.Overnight at Buhoma Community Bandas (Camping Ground) booked on Full Board: Lunch/Dinner/Breakfast. After breakfast depart for Lake Bunyonyi arriving in the afternoon. Have an optional walk around the communities to interact with the people of the area. However we recommend a rest in the afternoon at the lodge as you enjoy the sunset after the long drive.Overnight at Overland Camp Resort (Camping Ground) booked on Full Board: Lunch/Dinner/Breakfast. After breakfast depart for Lake Mburo National Park with lunch enroute. Arrive in the evening and enter with a game drive enroute to your campsite. During the short game drive, you might be lucky to see Buffaloes, Water buck Topes, and Elands among other animals. Overnight at Arcadia Cottages (Camping Ground) booked on Full Board: Lunch/Dinner/Breakfast. Have warm cup of tea or coffee and go for early morning game drive. Return to the lodge for full breakfast before heading out to a boat ride on the Lake. After the boat ride drive to Kampala arriving late in the afternoon. Overnight at Holiday Express Hotel booked on Full Board: Lunch/Dinner/Breakfast. In the morning have breakfast to go for a city ride at 8:00 am. 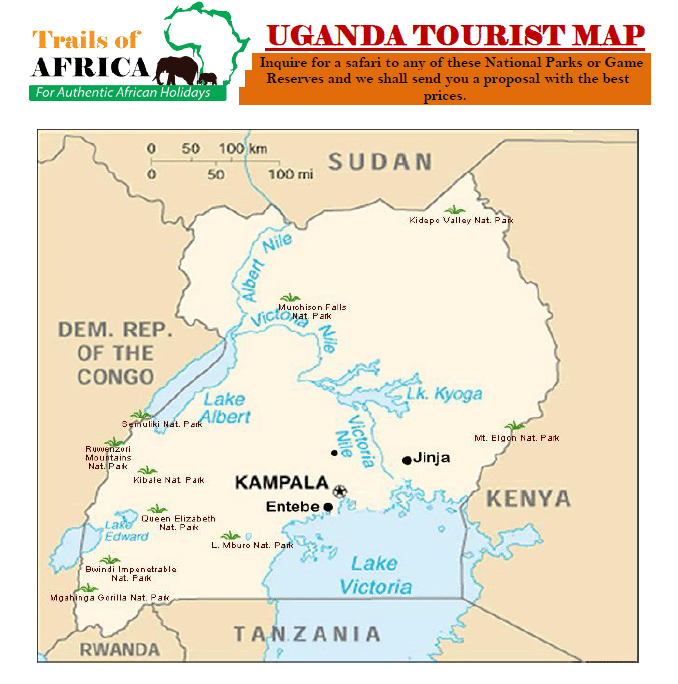 You will visit places like the Bahai temple, Uganda Museum, the Kasubi tombs and many more. • Visit to Ngamba Islands Chimpanzee Sanctuary • Whitewater rafting to Jinja • Tour towards Jinja the source of the NileOvernight at Holiday Express Hotel booked on Full Board: Lunch/Dinner/Breakfast. Breakfast and transfer to the airport to catch the flight back home.